Cooking is interactive. It encourages working together and taking turns. It helps to build self-esteem when the child is contributing to accomplishing a task and is working together as part of a whole group. Cooking also helps build attention-to-task skills, self-regulation and increases children’s self-direction abilities. Children also learn about initiative, responsibility, cooperation and leadership qualities. 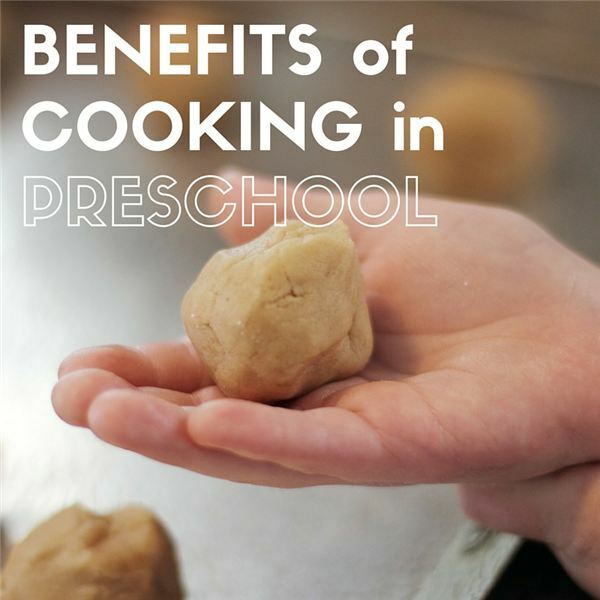 Cooking in preschool promotes cultural awareness and building knowledge about other cultures and their types of foods by trying different types of foods and discussing the how and why of newly identified foods. Cooking provides multiple opportunities for creativity and exploration. As we know, children learn through their senses. Cooking provides an unending amount of opportunities for touching, smelling and tasting all the new aromas and flavors. This expands their experiences with their environment and encourages curiosity and problem solving. Children may want to try various combinations of flavors and foods to see what they will smell like or taste like. Let them sample away! Cooking is filled with natural and authentic opportunities for learning mathematical and literacy concepts. Experimenting with measuring, counting, quantity and one-to-one correspondence are all naturally occurring learning opportunities embedded in cooking activities. Children can learn about mass by weighing different ingredients. Decorating a cake or cookies is a great time to review counting, colors and shapes. Explore with division while cutting pieces and fractions while using teaspoons to measure ingredients. Reading or writing recipe cards for following directions embeds literacy in a meaningful way. Help them find certain new words on the recipe cards or on the ingredient list of a box, such as flour, sugar or cinnamon. Making observations of the physical changes of food and predicting what might happen next if they try something new is an authentic way for children to experience hands-on scientific principles. “What will happen if I add more water? What will it look like if I mix these ingredients?" The opportunities are endless! Joint interactions between the children and the adults can be extended through cooking discussions. Asking questions encourages dialogue and self-expression. New vocabulary such as stir, kneed, mix, whisk and blender can be introduced and reinforced naturally. Children learn language when it is linked to meaningful activities. What better way to introduce new vocabulary than when you are cooking with it? Cooking is used as a way to incorporate upper arm exercises and fine motor skill development. Bi-manual tasks (using two hand together at the same time), arm extension, grasping tools, supination and pronation (the turning over of hands and arms), and finger isolation are all fine motor skills that can be naturally embedded in a meaningful and fun activity. Stirring and pouring helps to improve upper arm strength and control. There are multiple benefits and learning opportunities that can be included in such a way that children will be enjoying the activity so much they won’t even notice everything they are learning while they are doing it and it’s delicious, too!